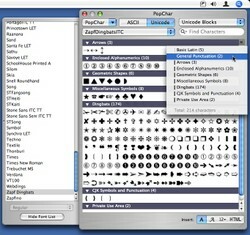 Set your fonts free on your Mac with Pop Char X 3.0! When I finally purchased my first Mac in 1992 it was a PowerBook 100, and the first and most important piece of software that I installed was a little shareware application called PopChar, which debuted in 1987. It added a tiny little “P” in the top left corner of your menu bar, and allowed you to instantly call up any hidden characters in the font you were using, and once you used it, you couldn't live wihtout it! Fourteen years later, it's on every Mac I own, and I’m still using it and consider it one of those really indispensable tools that make my Macs a lot more useful. PopChar made the transition to OS X, and since then it has consistently been kept current and updated over the years. This week the most current version, Pop Char X 3.0, was released by Ergonis software. While there are other tools out there that promise to make using your fonts easier, there isn’t anything as elegant, useful, or reliable as PopChar X. If you have ever needed to find the © or ® symbols in a hurry, or wanted to spell résumé properly, then PopChar X is for you. In 1987 when Günther Blaschek wrote PopChar as an antidote for Apple's own Key Caps utility, the font world was pretty simple - a few sets of hidden fonts, accessible via using either the shift key for caps or the option key for those hidden fonts. As PopChar approaches it's 20th anniversary, it's not uncommon for a unicode font to contain thousands number of characters, making font usage a bit more complicated! The new version is Universal Binary and adds a slew of new features including search, Unicode support, html coding, and much more, yet it’s still quick, easy, and simple to use! How many products can you think of that have lasted this long, are affordable ($29.99), and do just what you want, with no muss or fuss? PopChar X 3.0 is one of the few that can make that statement, and now it runs at full speed on an Intel Mac! For years it was only available on a Mac, but now for Windows users, PopChar Win is available … but we think it’s a lot sexier on a Mac! P.S. I'd been using, fixing, and configuring Macs since the Lisa.. but managed to live on borrowed ones in schools or businesses, so when the PowerBook 100's price was cut in half, it seemed time to bite the bullet!